January, the 25th, a new law n. 127 had been posted to a wall of a Vatican lodge. The new law immediately came into effect, since the posting is the form of the urgent decree. So, the Vatican has a new anti money-laundering law. Just a few are really aware of this, since Holy See made no major announcement of the revision. The new law meets international standards and exalts international vocation of the Holy See. With the new law, borders of Holy See are effectively not just with Italy, but with all Europe (because of a Monetary Convetion signed in 2009 with the European Union) and with all the world (because it meets Gafi Recommendations). Vatican Secretariat of State listened to critis moved to the old law, and remembered of the warnings of the governatorate. This effort allies with the Papal effort – the Pope is going to change the whole way of thinking of the Vatican relationships with the world, getting back to solidity of international law – and brings into line various insider frondeurs. There was not just law “n. 127 question”. In the last meeting with heads of Vatican departments (Prefectures and Pontifical Councils), Bertone asked more coordination among the several branches of the Vatican curia. He also pointed at the encroach of the «passion for the little news of ecclesiastical gossip, that undermine the Holy See prestige and sometimes crab the climate of confidence and trust among the Holy See’s bodies». The Pope presided the meeting, and he agreed with each word of his Secretary of State. In 2009 – in his letter to the bishops of Catholic Church concerning the remission of the excommunication of the four bishops consecrated by Archbishop Lefevbre – the Pope quoted this paragraph from Galatians 5:13-15: «Do not use your freedom as an opportunity for the flesh, but through love be servants of one another. For the whole law is fulfilled in one word: ‘You shall love your neighbour as yourself’. But if you bite and devour one another, take heed that you are not consumed by one another». There has been some «bite and devour» against Bertone, too. Since he has been appointed as Secretary of State, the attacks against him had been continuous. Before Bertone turned 75, several influential cardinals had asked Pope Benedict to make a change in Secretariat of State, because of problems with curial government and the lack of coordination that had taken place. Now that he turned 77, many observers spread the voice that there should be a change of leadership in the control room of the Roman Curia. 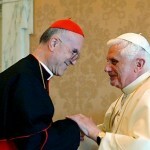 Benedict XVI and Bertone are following the same footsteps. Step by step, they are changing the Vatican approach. Not casually, Benedict XVI wanted an expert of Canon Law as Secretary of State, and not a diplomat. This choice was not well taken by diplomats and his protégés, that increased their influence under the former Secretary of State, cardinal Angelo Sodano. But it is part of a long-sighted project of Benedict XVI. The Secretary of State must not necessarily come from the diplomatic service. His function is to «provide close assistance to the Supreme Pontiff in the exercise of his supreme office», and this close assistance does not deal just with diplomatic relationships. For example – according to Pastor Bonus pastoral constitution – the Secretariat of State must «draw up and dispatch apostolic constitutions, decretal letters, apostolic letters, epistles, and other documents entrusted to it by the Supreme Pontiff». An expert of Canon law – and Bertone is – could better coordinate the drawing of documents. The Pope himself – in the 2010 letter to the Catholics of Ireland – wrote that «the program of renewal proposed by the Second Vatican Council was sometimes misinterpreted and indeed, in the light of the profound social changes that were taking place, it was far from easy to know how best to implement it. In particular, there was a well-intentioned but misguided tendency to avoid penal approaches to canonically irregular situations». Turning back to the solidity of law, to remember Christian roots and to turn back to God. This seems to be the Benedict XVI’s plan for the universal Church, as the next Consistory would show. 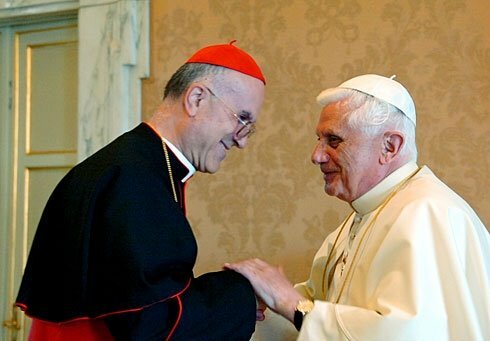 So, attacking Bertone means attacking Benedict XVI. Was that a case, some insider questions, that the strongest attacks against Bertone leadership – the Viganò’s scandal and the consistory itself – came right when the Holy See was strengthening is international impact? Who wants to undermine Holy See international impact? In fact, in those days Holy See rewrote its 2010 anti-money laundering law, the Vatican law n. 127. It is important to see what the new law really is about, going beyond the possible «bite and devour strategy». It was maybe to prevent that strategy that Holy See made no major announcement of the revision, while the Vatican’s foreign minister, Archbishop Dominique Mamberti, referred obliquely to it in an article Friday in the Vatican newspaper L’Osservatore Romano. This is probably also the reason why the law come into effect with an urgent decree, to be ratified by the Pontifical Commission of Vatican City State within 90 days. The first point of the new Vatican law n. 127 is about financial transparency; the law acknowledges the right to privacy, and at the same time shed the obscurantist myth of Vatican secrecy. In fact, the Vatican law n. 127 aims to protect the right to privacy acknowledged in all the civil countries – the right to privacy is even mentioned in Gaudium et Spes, one of the Constitutions of the Second Vatican Council – and at the same time it aims to favor the international exchange of financial information. Why did the Vatican modify the law just one year after its introduction? In fact, the law n. 127 had been written in haste because of several reasons. One of this reasons was the need to solve the «IOR case», that is the seizure – ordered by Italian magistrates – of 23 million euro transferred by the IOR from an account it owned to the Credito Artigiano toward Jp Morgan (20 million) and Banca del Fucino (3 million). Another reason was the need to bring into effect the Monetary Convention with European Union signed in 2009. It was not downhill to the Monetary Convention. Since February 2009, Vatican and European Commission advisors (Italy was part of the table as observer) start up the job to define the new monetary agreement. European Union conditions immediately seemed too restrictive. The relationship between Holy See and European Union were fraught. Vatican had the will to keep its autonomy, and Mons. Carlo Maria Viganò, then secretary of the Governatory of the State of Vatican City, even proposed to unhook Holy See from the Euro area, in order to let the Holy See avoid to be subjected to too restrictive conditions. Someone also proposed not to close the agreement within the year 2009, and to postpone the closure of the agreement to 2010. But time is short, and hierarchies of the Holy See did not take in consideration both of the hypothesis. The monetary agreement was finally signed on December, 17th 2009. Joaquin Almunia, Europen commissioner for Economical and Monetary Affairs, and mons. André Dupuy, Apostolic Nuncio to the European Union should sign together. But Almunia refuses to sign the agreement in the same room with the pontifical representant, and so Dupuy and Almunia sign the agreement each one in their own office. Even inside the Vatican, things went on quickly. The Vatican Law n. 127 is adopted and it is decided to extend the effects of the new regulations to the Holy See via a motu proprio by Benedict XVI. The Motu Proprio is released the 30th of December 2010, right in time not to let the agreement lapse. According to some Vatican insiders, the institution of the Authority for Financial Information would mean that the same Ettore Gotti Tedeschi, president of the Commission of Vigilance of the I.O.R., is not given a blank cheque by the Pope, since the I.O.R. itself is subjected to monitoring. This is even truer for what concerns the new law: Jeffrey Lena, the Vatican’s U.S. attorney, noted for example that the new law allows for the IOR itself to be sanctioned up to €2 million if it violates the law — and it also allows for the IOR to have recourse to the Vatican’s court system to appeal. Modifications of the law – promoted by the Vatican Secretariat of State and the Pontifical Commission of Vatican City State – seem to mean that the new law is not merely «a slap on the face» for some contingent problem. Holy See is going to meet the international standards, and it does not seem to be an occasional concurrency that the same day the implementation of law n. 127 came into effect with an urgent regulations, Holy See announced the ratification of three international agreements. Holy See adhered to and ratified the International Convention for the Suppression of the financing of terrorism (Onu, New York, 1999) and the United Nations Conventions against the transnational organized crime (Palermo, 2000). Holy See also announced the ratification of the United Nations Convention against illicit traffic in narcotics drugs and psychotropic substances (Wien, 1998): this latter Convention had been already signed by the Holy See when it had been adopted by United Nations. It was January, 25th. During those days, medias highlighted Vigano’s scandal, depicting it in the terms that Vatican could be considered a multinational company whose seat is in Italy. Some days later, a confidential memo on IOR-Aif (Authority for Financial Information) relationships had been leaked to the press. This memo was equivocally a blight on the Vatican transparency toward Italian authorities. Anyway, the IOR case emphasized almost an excess of diligence by Ettore Gotti Tedeschi, president of the Supervisory Commission of the IOR. Gotti Tedeschi agreed to be questioned by the Italian magistrates, even if these latters did not submit the request internationally. Many Vatican insiders considered the Gotti Tedeschi’s one a «questionable decision». It is because this decision seems to be a renounce to the immunity by Gotti Tedeschi, and this renounce to immunity could be eventually extended to the body of State he presides. It is important to say that it is not only an Italian-Vatican matter. The improval of the Vatican law n. 127 bodes to a long-sighted choice. In fact, Jeffrey Owens, head of tax issues at the Organization for Economic Cooperation and Development which maintains the «white list» of the virtuous State in countering money laundering, said to Associated Press that the Vatican is heading in the right direction with the revised norms. «What I see in these developments – Owens said – is that the Vatican has recognized that in today’s financial environment there is a premium on transparency and that to achieve this, this must conform to the highest international standards, whether in the area of money laundering, tax evasion or bribery». If the «old» law n. 127 had been written in haste, the «new» law shows that Holy See means business on contrasting money laundering. After just one year, Holy See changes his law as requested by MONEYVAL Adivsors, come for an on-site visit in the Vatican the last November. The advisors noted inadequacies in the Vatican legislation. According to MONEYVAL official communiqué, «at the conclusion of its mission, the MONEYVAL team shared and discussed its initial findings with representatives of the Holy See, after which initial views were exchanged». Of these inadequacies, the Holy See was aware. The common references are the 40+9 GAFI recommendations – references that every country should follow. There are substantial news. For example, the “old” law n. 127 gave the power to supervise and contrast the money laundering to one only authority, the Authority for Financial Information – established via Motu Proprio by Benedict XVI in 2010. The “new” law fairly share the power among other authorities, that are the Vatican Secretariat of State, the Pontifical Commission of the Governatorate of Vatican City State, the Authority for Financial Information, and also the Vatican Gendarme Corps. This technicality confirms the long-sighted Vatican policy. Jurisdictions are called – coherently to the principle of rule of law – to involve all their institutions, thus competent authorities must follow the same rigour and transparency policy in order to prevent and countering money laundering and financing terrorism. It is interesting to see that Holy See met the challenge to adequate to International standards without denaturalizing their institutions. In Vatican City State, in fact, there is no market and there are no banks. According to the Italian Supreme Court, IOR is «a central body of the Church», that is a governmental body that does not aim to distribute assets. One example of the effort of the Holy See is the procedures to take into consideration the list of terror organizations issued by the Security Council of United Nations. According to the law n. 127, Holy See does not mechanically transpose the United Nations Lists. This choice is aimed to preserve the Holy See and Vatican neutrality. In fact, lists are written under the «Chapter 7» of Charter of the United Nations, and that Chapter is applied in war time. Holy See could be embarrassed by a mechanical transposition of the lists, since it could be in contradiction with the Holy See orientation – Holy See is neutral and in favor of peace. Since Holy See is Permanent Observer to the Assembly of United Nations, and not a Full Member, a settlement has been made to the autonomy of the Holy See: the Vatican Secretariat of State – according to the new article 24 of the law n. 127– will create its own list of terror organizations based on the one issued by the United Nations, so keeping its autonomy, and at the same time showing to be sensitive to the international security goals. Some superficial observer would think that Holy See is not working seriously. It is not true. Holy See is working seriously, and not to respond to internal problems, or to answer to European or Italian claims. More probably, Holy See wants to give its contribution to achieve strategic goals as the countering to money laundering and to international terrorism financing. One Response to Behind the «bite and devour». Holy See improves anti-money laundering Vatican law.